Sensory bins are fabulous for an entire host of reasons-they are great for stimulating the senses, fine motor skills, building imaginations, language development, they are a great way to reinforce a theme, and they are just a plain old ton of fun! 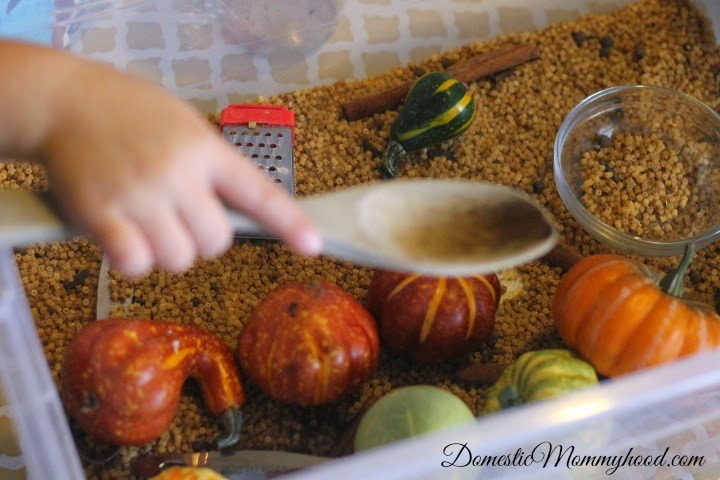 With the chill and scents of fall in the air it is a great time to plan a fall or Thanksgiving themed sensory bin. They are simple to make and can be quickly put together to match any theme using items from around your home. Whether you are a homeschooler or a mom looking for fun activities for kids they are the way to go. If you are looking for an activity specifically to keep the kids busy for Thanksgiving while you are making the meal or for afterwards a sensory bin or two is a great activity for them. My kids will play in a good sensory bin for hours. The key to keeping them interested is to make it amazing- a great scent, various textures, different ways to play with the contents inside, and they love a theme! This particular sensory bin I went with a Thanksgiving Theme that started with a base of pasta , added a few additional pantry ingredients, some cooking supplies, and finally mini pumpkins. To make the colored and scented pasta couldn’t be easier. 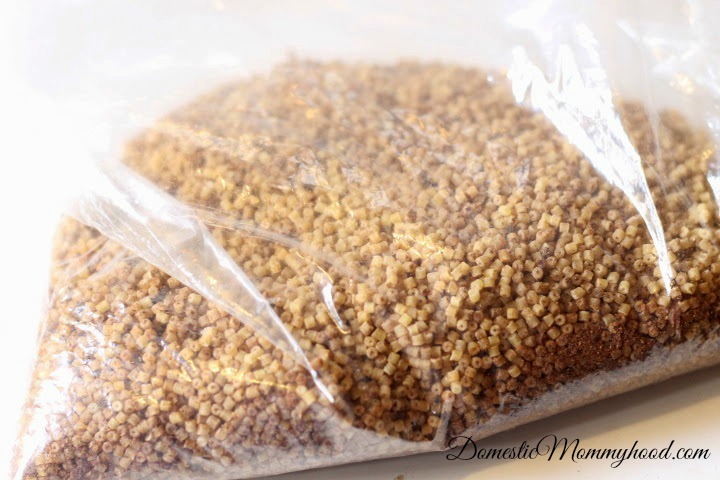 Pour 3-4 cups of dry pasta into a gallon zippered bag and add; ½ tsp. allspice, 1 tsp. cinnamon, 1 Tbsp. Pumpkin Pie Spice, and 2 tsp. 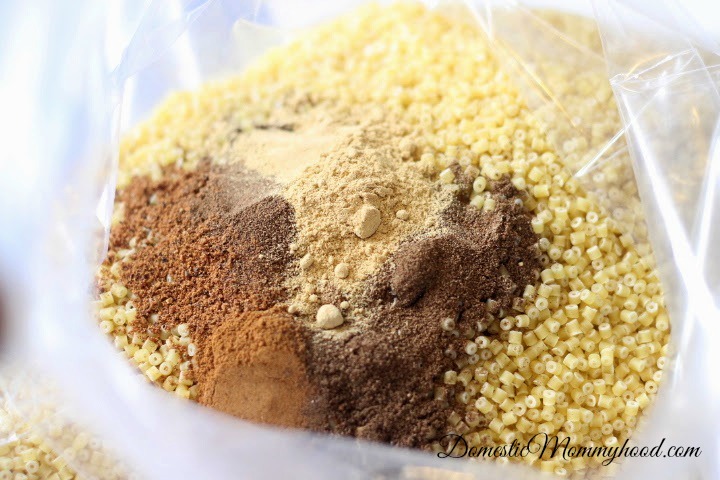 of vanilla extract- you may need to add a little water, not much you just want enough liquid to move spices throughout bag. To color my pasta a little darker than what the spices would do I added a little brown gel food coloring. Massage contents of bag until pasta is well coated, open bag and let dry for an hour or so. 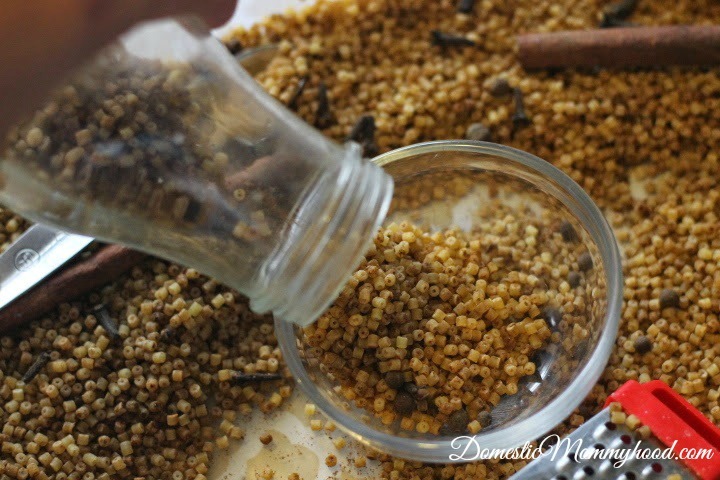 The beauty of this is that you can use whatever spices you have on hand-apple pie spice, cinnamon, cloves, allspice, etc… to create a delicious scent. You can make colored/scented rice the same way. Once you have made your filler and colored/scented it you can pour it into a plastic tub, you can use what you have on hand but I recommend using one with sides at least 4” tall and 12” wide x 24” long and preferably with a lid so you can close it up and reuse it later. 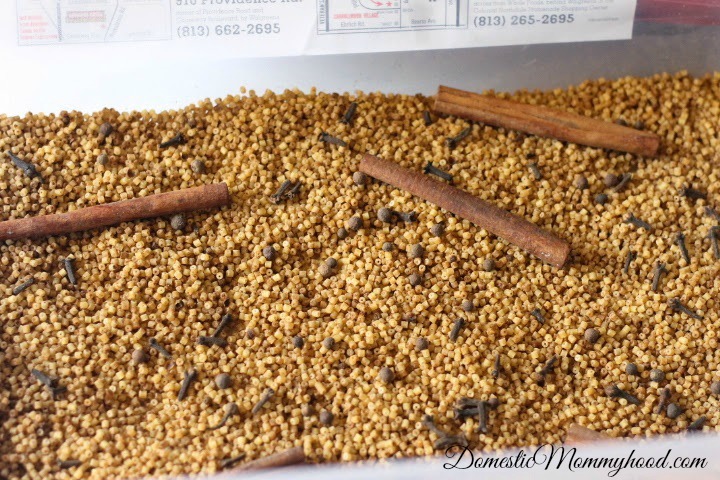 After putting in the filler I added small items like cinnamon sticks and a tablespoon of cloves. For the final layer place small bowls, spoons, cups, and other kitchen tools for scooping, pouring, filling mixing, measuring,etc.. If you use this bin all week swap out a couple items for new ones each day to keep it interesting. Charlee Ann had a great time playing with her Thanksgiving themed sensory bin. Here are a few of her favorite activities! She really enjoyed filling up her containers and pouring them from one to the other. 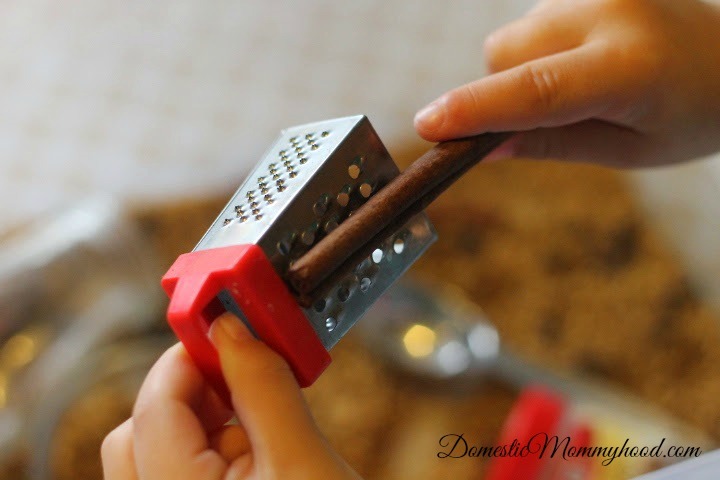 Grating the cinnamon sticks with the mini grate made her feel like such a big girl! She made me a few bowls of pumpkin noodle soup! It was delicious!! 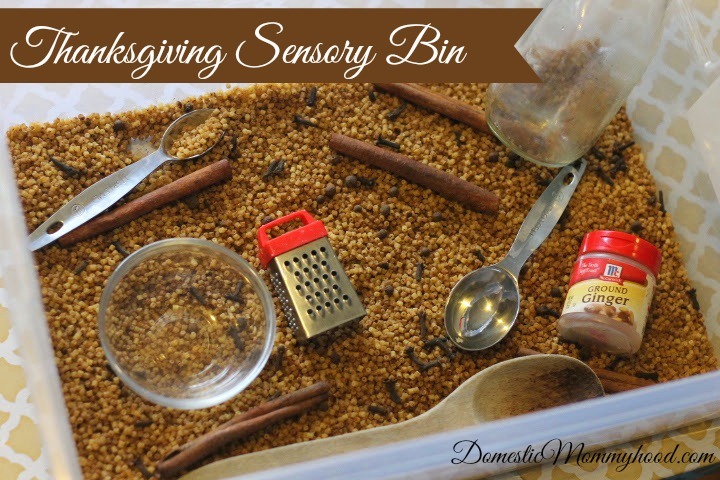 Who do you plan on making a Thanksgiving Sensory Bin for?? I love sensory bins and this is a great one. Thanks for sharing. I love love love this! How creative!! Thank you for sharing!